To address these problems, it’s best to build TrueCrypt from source. Here are some instructions. You’ll need a 64 bit cpu for this to work. Download the TrueCrypt 7.1 source code (not sure whether I’m allowed to redistribute it). Update 19th Oct 2013: The patch is now under version control as a gist on github. Update 28th Oct 2013: These instructions are not yet recommended for OS X 10.9 (Mavericks). MacPorts doesn’t seem to be ready yet. The executable will end up in Main/TrueCrypt. I’d recommend to uninstall fuse4x and fuse4x-kext in that case to avoid any mess. Update 17th Nov 2013: Portfile is available on github now. If you’d like to see this integrated into MacPorts, please voice your support here. Update 20th Apr 2014: Updated Portfile to switch to osxfuse because fuse4x has been deprecated by MacPorts. Update 2nd Jun 2014: As TrueCrypt is down and the code isn’t available any longer from the official site, I’ve decided to start a Github repo that contains all changes that are required to build on OS X 64bit. This may also be useful for other platforms as the code was ported to wxWidgets 3.0 in the process. Great guide, I’ve been trying to get TrueCrypt to compile on OS X for a week or so, this cut my build errors ten-fold. I’m still getting errors regarding wx-widgets when I build though. Any idea what’s going on? I installed wxWidgets-3.0 through MacPorts as you’ve shown. Any help would be appreciated. Thanks for the report. There were 2 issues: First, wx-config doesn’t get installed by default any longer unless a wx version is explicitly selected. Second, the API for wxStandardPaths has changed. I’ve edited the instructions (new step 3) and the patch accordingly. You’ll have to apply the revised patch to a pristine source tree – it’s probably easiest to start over with step 3. Thank you so much for putting this together – I _never_ would have figured this out (well, without a whole lot of hours sunk in, anyway). – MacPorts might need to have the Apple Command Line Developer Tools installed to successfully perform step 2, otherwise one could end up with error messages like “Unable to execute port: can’t read “build.cmd”: Failed to locate ‘make’ in path: ‘/opt/local/bin:/opt/local/sbin:/bin:/sbin:/usr/bin:/usr/sbin’ or at its MacPorts configuration time location, did you move it?”. Unfortunately, these tools are not installed by default (at least not in Xcode 5). You can however download and install the Apple Command Line Developer Tools by opening Xcode and pressing “Cmd + ,” which gives you a download interface for additional installable Xcode components, amongst them the tools. – I also had to copy Pkcs11, Pkcs11f and Pkcs11t into /Common to get TrueCrypt to compile successfully. Thanks for pointing out the MacPorts prerequisites, which are now mentioned in the instructions. Not sure why you would have to copy the pkcs headers to Common – are you sure you downloaded them to “Pkcs11” (note the capitalised “P”)? Yes, you’re right, I’m sorry. – I couldn’t reproduce the error today when I compiled TrueCrypt again for a double check, so please excuse the false alarm. I tried to install gnutar and it choked trying to install one of its dependencies ‘expat’ which (you guessed it) also uses gnu tar to unpack itself. Thanks again. It’s working for me, but first I completely uninstalled Macports, then installed the Mavericks version which just became available. All the prereqs started and I’m able to build! I just tried this on Mavericks and received the same diagnostic message. Any additional information? Please ignore My comment. The port file works. Hello, thank you for the great work done on Truecrypt. Since the official build doesn’t seem to be updated lately, I was wondering what I should use. However, I found that this doesn’t seem to work for Hidden drives. i.e. it gives an error saying the OSX can’t support advanced formats when creating the outer disk (in a full disk encryption) that is bigger than 2GB. I am wondering if someone has a workaround for the issue. Also, is the above method you outlined in the blog post now ready to be used on Mavericks? This version works fine for me with volumes > 2GB. Not sure about all “advanced formats” though. MacPorts 2.2.1 has just been released and should be fully compatible with Mavericks. I have Xcode installed, and found there was a very old nasm under /usr/bin that was causing build breakage. The solution was to update Makefile explicitly point to the new ports nasm version. Thanks for the report. Usually, MacPorts modifies your PATH in ~/.profile so that /opt/local/bin takes precedence over /usr/bin, but there’s obviously no guarantee. I’ve modified the patch following your suggestion to make sure MacPorts’ nasm is used. I attempted to build Truecrypt from your instructions. Is it possible to change truecrypt into using the installed version of OSX Fuse on the system? to whatever CXXFLAGS osxfuse requires, e.g. or wherever your osxfuse header files are located. to whatever link flags osxfuse requires, e.g. The issue that you’ve reported (bad mount point) had nothing to do with fuse. I’ve fixed it in a revised version of the patch. Please test. Its working! I was able to mount my truecrypt drives with the new patch under mavericks. Thanks! Ok, testing it a little bit, I found a rather peculiar bug. After closing the truecrypt window with a drive mounted, the truecrypt window does not reappear when clicking the dock icon. When this happens, when I go to preferences, the truecrypt window reappears but as a white box with nothing in it. 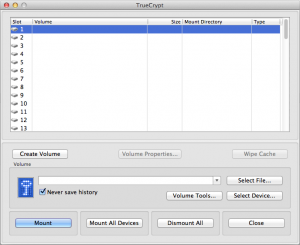 Quitting and reopening truecrypt can reopen truecrypt with its regular window. I’m a newbie in the unix world. Could you explain why using the -j4 option for make command? Thanks a lot. This allows 4 parallel jobs to speed up building. See make -h and man make for further information. The short answer is: MacPorts doesn’t seem to be ready for Mavericks yet. For a longer answer, you’d have to look into the log file to see where it failed. Thanks for your feedback. I’m aware of the GUI problems on OS X 10.9, that’s why I recommend using the command-line version on Mavericks for now. Are you aware of this topic? Any experience? I was made aware of it by a comment here in the forum. So far there hasn’t been any feedback on advanced format drives. In case there are problems, I’d be happy to merge in lenlo’s patch (would obviously have to ask her/him for permission first). It would be beneficial to put all this into a homebrew formula! I’ve offered to put together a Portfile, but there hasn’t been any interest so far. Regardless of whether Homebrew or MacPorts is used, it’s unclear whether the TrueCrypt license allows you to redistribute the source code; it’s also impossible to get a stable link to the source tarball because they want you to accept the license before downloading. Yes, and a Mac Port would be great. Portfile is available on github now. If you’d like to see this integrated into MacPorts, please voice your support here. Thanks a lot for your great guide. I’m trying to build truecrypt with wxwidgets 3.0 static library, but it doesn’t work. These are what I do. 1. compile wxwidgets 3.0 source code. 2. copy contents in mac-release folder to wxrelease folder in truecrypt directory. 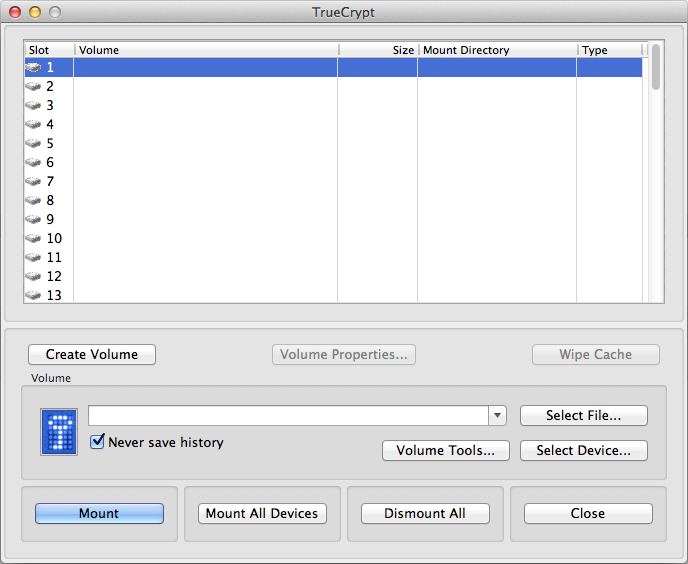 3. compile truecrypt following all the steps in this article(except not installing wxWidgets-3.0 and fuse4x). when i build with ‘make WXSTATIC=1’, it shows me this error. Any idea why this does not work? Thanks in advance! Works like a charm! Thanks a lot! Seems like the inbox libiconv doesn’t support X86_64? when I run “otool -L Truecrypt”, it shows i need the /opt/local/lib/libiconv.2.dylib library, the macports version. The static wxwidgets library also depends on external shared librarys, right? Does that mean if I want to use the application on another Mac, I need to make a distribution package to install both the app and libiconv library, or just use macports to install the wxwidgets? Is it possible to combine all the dependencies into the final app? The easiest way to generate a portable app is arguably to create a binary installer with MacPorts. The Portfile for TrueCrypt is available on github. See here for how to use local Portfiles. If you’d like to see this integrated into MacPorts, please voice your support here. Great job on the guide, helped me to use my containers after upgrading to 10.9 – Zero issues. Very nice write up. Interestingly enough I couldn’t make the port work, it complained about not being able to use wx-setup which was weird because it was certainly able to install wxwidgets without issue. So I’m not entirely sure where that port fails, and ports really aren’t my area of expertise. I would guess that it didn’t have it included in the path yet, maybe a build order thing. Not sure. Building it myself had no issues however. Not sure what’s going on there, but I needed to anyways because I wanted to use osxfuse. Thanks for saving me some time in figuring this out myself. Additionally as you stated many of the GUI elements don’t function correctly, not that it’s necessary. Hi, are you running Mac OS X Mavericks with OSXFUSE 2.6.2? If so, do you experience the problem that “Dismount All” in GUI verison always consumes a lot of time while the cursor is spinning. It has nothing to do with wxwidgets. Maybe a truecrypt or hdiutil bug? I just want to confirm if anybody experienced the same problem? Thank you! Yes, I found the same thing, when using the GUI, dismount all takes a long time. However, I have switched to using only the command line, and that dismounts instantly. So the behavior seems specific to the GUI implementation. I found that if I quit the GUI app and launch it again, dismounting only takes a second to finish. Weird!! This post is the place. If you scroll up to to the top you will find a guide to set up the TrueCrypt source code on MacOS. Awesome guide. Thank you very much. Saved me probably hours. Probably MacPorts does that but I don’t use it so I wouldn’t know. Anyway, you may want to add retina support as well to your patch. Icons are still scaled but at least fonts are sharp. The GUI issue is not limited to Mavericks. I just compiled it on 10.6.8 and several GUI elements are not working. I do understand that a GUI is just secondary, but especially now (after TrueCrypt shut down) it would make sense to get it working. Any idea how to do that? I’m not a GUI person, but I’d like to try and with help from a few people, I’m sure we can get it done. I’ve just started a Github repo that should simplify collaborating on the code. As a first step we’d need to find out where the broken GUI elements are located in the code. A github repo is a great idea. I’ve done the same thing, but I used a different name, since we cannot use the original name. I’ve added the user neurodroid as a collaborator and you have full access to the repo. We have to change the name in the code from the original to the new name and also use a different icon. I also did not add the pkcs includes (they are on my system anyway), because I’m not sure if we are allowed to distribute them. As mentioned before, I’m not a GUI (nor Windows) person, but I was thinking about adding other encryption algorithms in the future. cs, could you shortly explain what the exact role of FUSE for OS X (or abbreviated: osxfuse) here is? It is my understanding that FUSE for OS X has traditionally been used by the OS X versions of TrueCrypt to access NTFS file systems inside TrueCrypt containers. That being said, I wonder if installing the osxfuse package through MacPorts will interfere with the Paragon NTFS driver that I use or if the latter could replace the osxfuse functionality? Or is the fact that we’re installing the osxfuse package through MacPorts here only relevant for the compiled application? Does anybody see the error there? – Thanks!